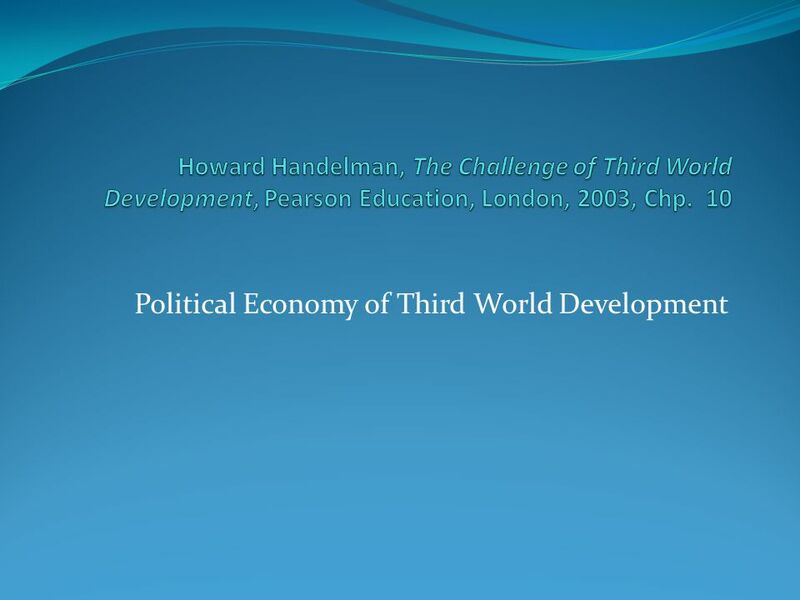 In recent years, scholarship on the Third World has increasingly turned to political economy. Martin Staniland defines this field as the study of “how politics determines aspects of the economy, and how economic institutions determine the political process as well as “the dynamic interaction between the two forces”. This chapter focuses on several important economic issues: What should the role of the state be in stimulating and regulating economic growth and industrialization in the LDCs? What are the major strategies for development? How should countries deal with the deep economic inequalities that persist or even increase, during the modernization process? 3 The Role of the State During the sixteenth and seventeenth centuries, major European powers were guided by the philosophy of mercantilism, which viewed a nation’s economic activity as a means of enhancing the political power of the state and its monarch. Government was viewed as “both source and beneficiary of economic growth”. 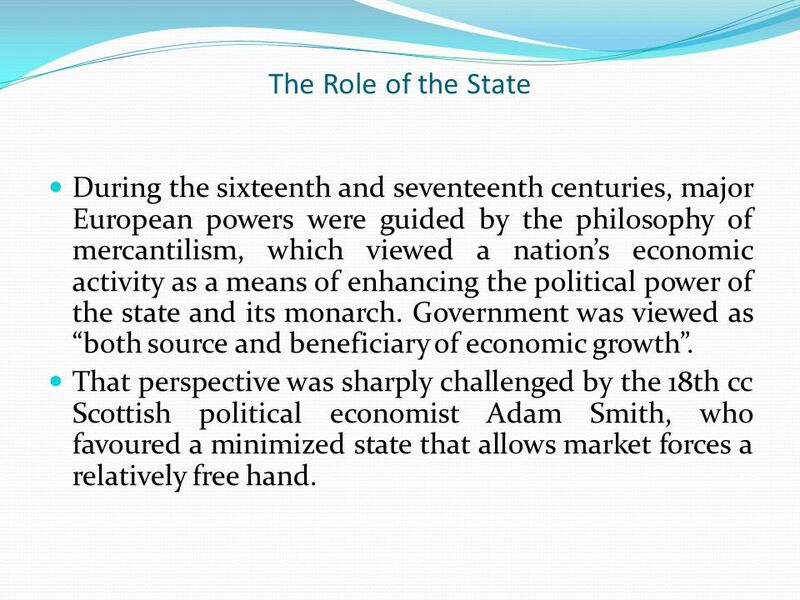 That perspective was sharply challenged by the 18th cc Scottish political economist Adam Smith, who favoured a minimized state that allows market forces a relatively free hand. 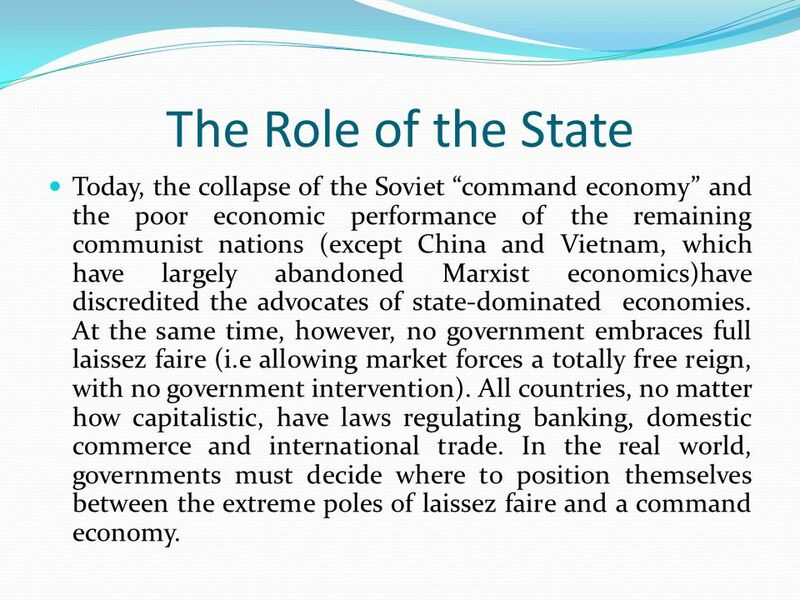 4 The Role of the State Today, the collapse of the Soviet “command economy” and the poor economic performance of the remaining communist nations (except China and Vietnam, which have largely abandoned Marxist economics)have discredited the advocates of state-dominated economies. At the same time, however, no government embraces full laissez faire (i.e allowing market forces a totally free reign, with no government intervention). All countries, no matter how capitalistic, have laws regulating banking, domestic commerce and international trade. In the real world, governments must decide where to position themselves between the extreme poles of laissez faire and a command economy. 5 The Role of the State In the less developed countries (LDCs), the fragile nature of many Third World economies, their high levels of poverty, their poor distribution of wealth and income, their extreme dependence on international market forces, and their endangered natural environment have encouraged many governments to assume an active economic role. 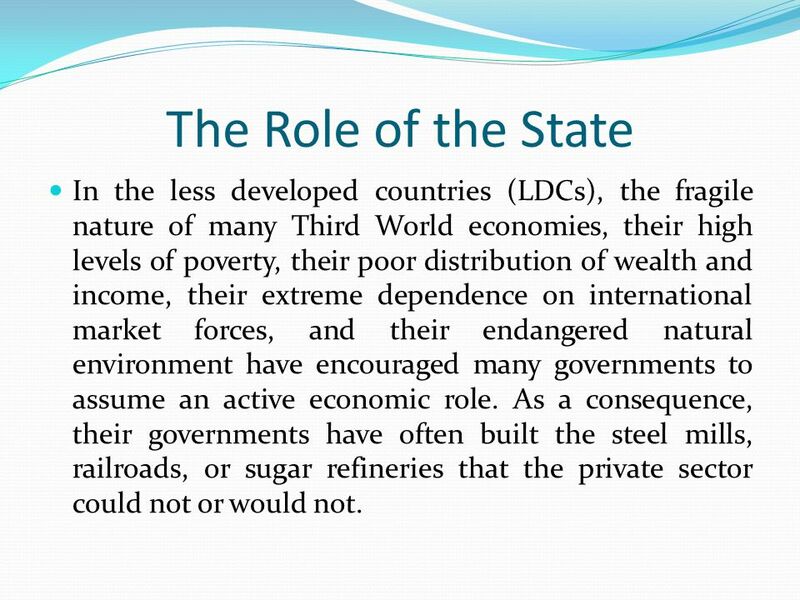 As a consequence, their governments have often built the steel mills, railroads, or sugar refineries that the private sector could not or would not. 6 The Role of the State More recently, governments have been called upon to protect the environment against the ravages of economic development. Not surprisingly, state economic intervention traditionally has been more pronounced in Africa, Latin America and South Asia than in the West. In recent decades, however, a worldwide trend toward “neoliberal” economic policies has sharply reduced government economic intervention in both the developing and developed world. 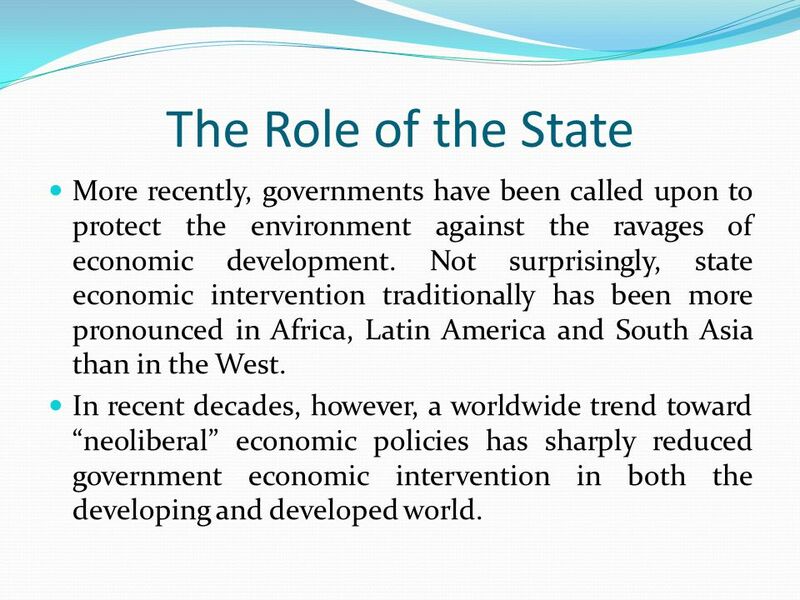 7 The Role of the State What follows is a discussion of a number of alternative models prescribing the role of the state in Third World economies, ranging from command economies such as North Korea’s to very limited state intervention in Hong Kong. Yet these are just ideal types, few countries fit any of these models perfectly. 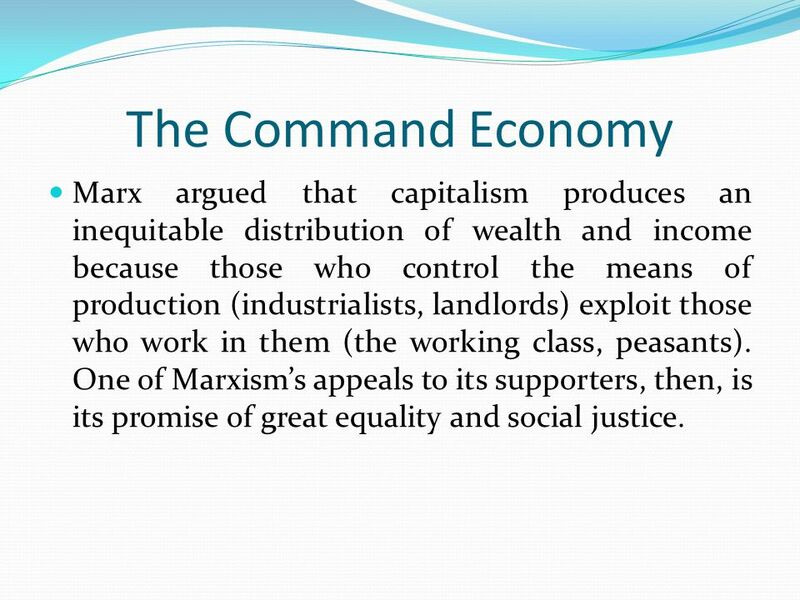 8 The Command Economy Marx argued that capitalism produces an inequitable distribution of wealth and income because those who control the means of production (industrialists, landlords) exploit those who work in them (the working class, peasants). One of Marxism’s appeals to its supporters, then, is its promise of great equality and social justice. 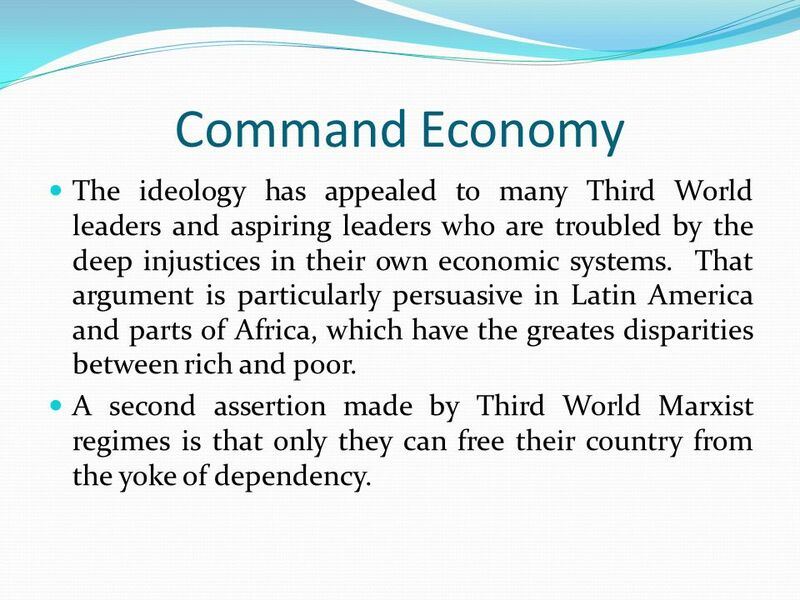 9 Command Economy The ideology has appealed to many Third World leaders and aspiring leaders who are troubled by the deep injustices in their own economic systems. That argument is particularly persuasive in Latin America and parts of Africa, which have the greates disparities between rich and poor. A second assertion made by Third World Marxist regimes is that only they can free their country from the yoke of dependency. 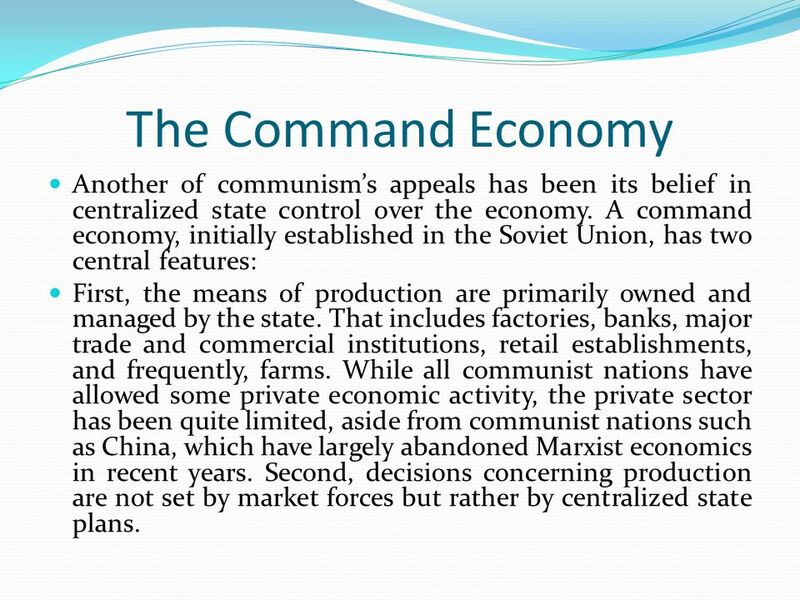 10 The Command Economy Another of communism’s appeals has been its belief in centralized state control over the economy. A command economy, initially established in the Soviet Union, has two central features: First, the means of production are primarily owned and managed by the state. That includes factories, banks, major trade and commercial institutions, retail establishments, and frequently, farms. While all communist nations have allowed some private economic activity, the private sector has been quite limited, aside from communist nations such as China, which have largely abandoned Marxist economics in recent years. Second, decisions concerning production are not set by market forces but rather by centralized state plans. 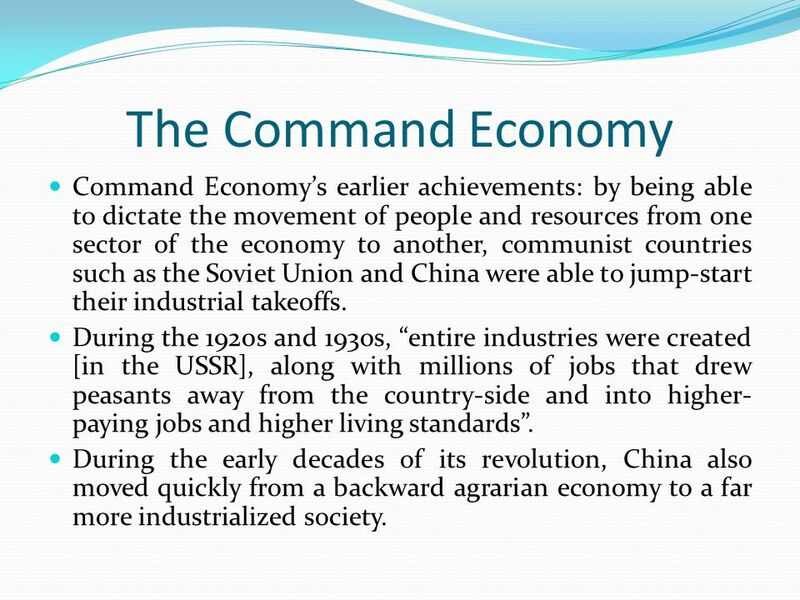 11 The Command Economy Command Economy’s earlier achievements: by being able to dictate the movement of people and resources from one sector of the economy to another, communist countries such as the Soviet Union and China were able to jump-start their industrial takeoffs. During the 1920s and 1930s, “entire industries were created [in the USSR], along with millions of jobs that drew peasants away from the country-side and into higher-paying jobs and higher living standards”. During the early decades of its revolution, China also moved quickly from a backward agrarian economy to a far more industrialized society. 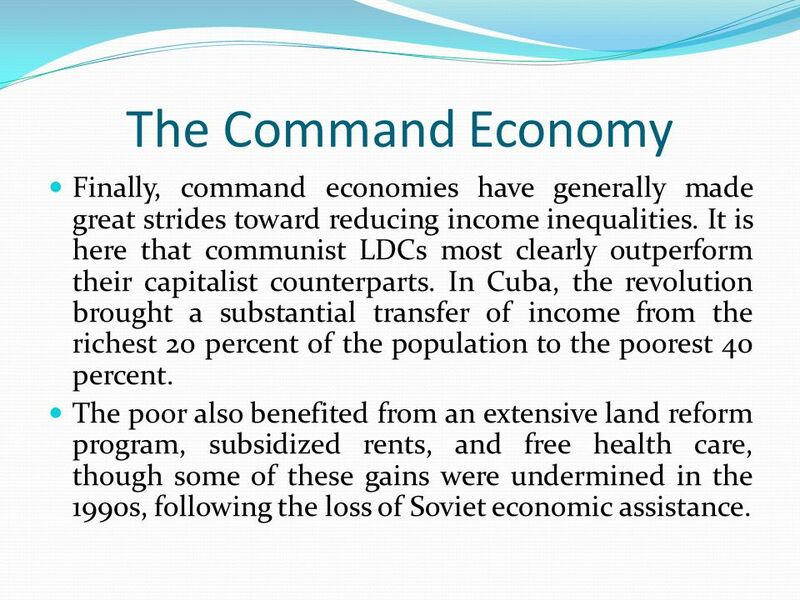 12 The Command Economy Finally, command economies have generally made great strides toward reducing income inequalities. It is here that communist LDCs most clearly outperform their capitalist counterparts. In Cuba, the revolution brought a substantial transfer of income from the richest 20 percent of the population to the poorest 40 percent. The poor also benefited from an extensive land reform program, subsidized rents, and free health care, though some of these gains were undermined in the 1990s, following the loss of Soviet economic assistance. 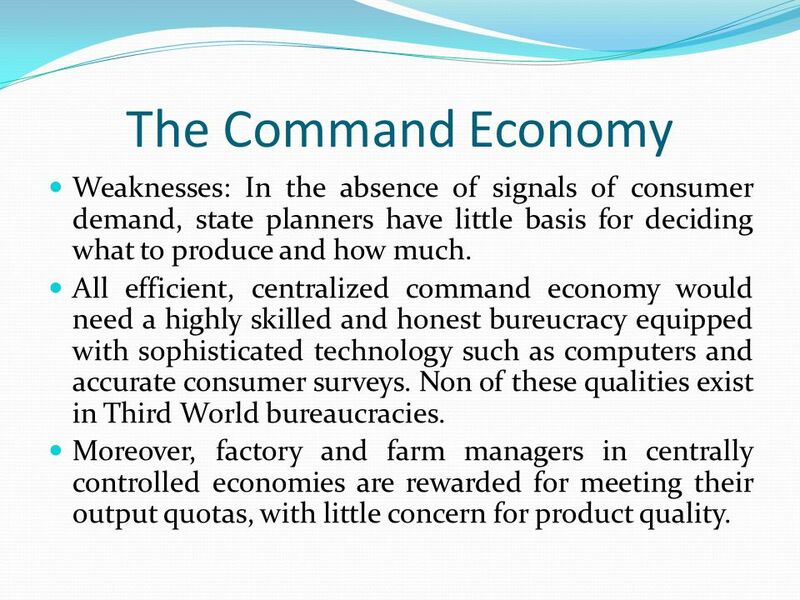 13 The Command Economy Weaknesses: In the absence of signals of consumer demand, state planners have little basis for deciding what to produce and how much. All efficient, centralized command economy would need a highly skilled and honest bureucracy equipped with sophisticated technology such as computers and accurate consumer surveys. Non of these qualities exist in Third World bureaucracies. Moreover, factory and farm managers in centrally controlled economies are rewarded for meeting their output quotas, with little concern for product quality. 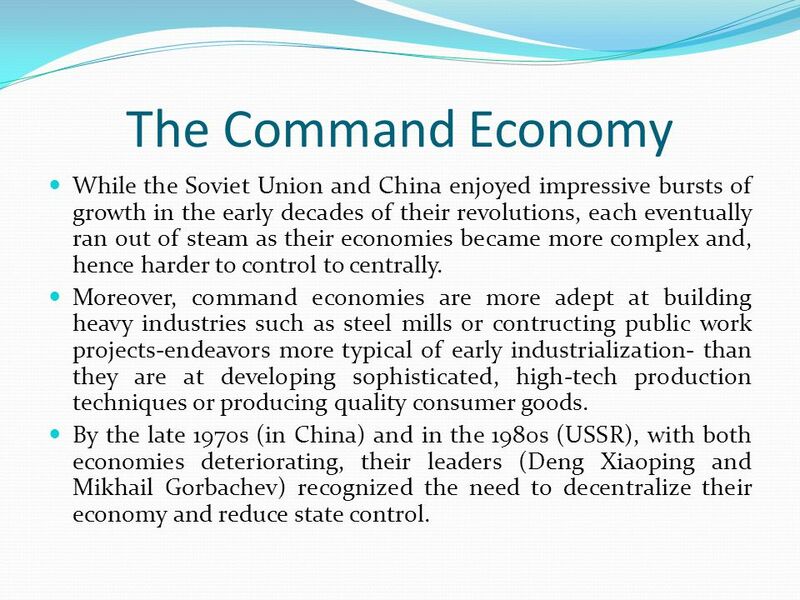 14 The Command Economy While the Soviet Union and China enjoyed impressive bursts of growth in the early decades of their revolutions, each eventually ran out of steam as their economies became more complex and, hence harder to control to centrally. Moreover, command economies are more adept at building heavy industries such as steel mills or contructing public work projects-endeavors more typical of early industrialization- than they are at developing sophisticated, high-tech production techniques or producing quality consumer goods. By the late 1970s (in China) and in the 1980s (USSR), with both economies deteriorating, their leaders (Deng Xiaoping and Mikhail Gorbachev) recognized the need to decentralize their economy and reduce state control. Even in capitalist Third World countries, the state has often played a major economic role, seeking to be an engine of economic growth. 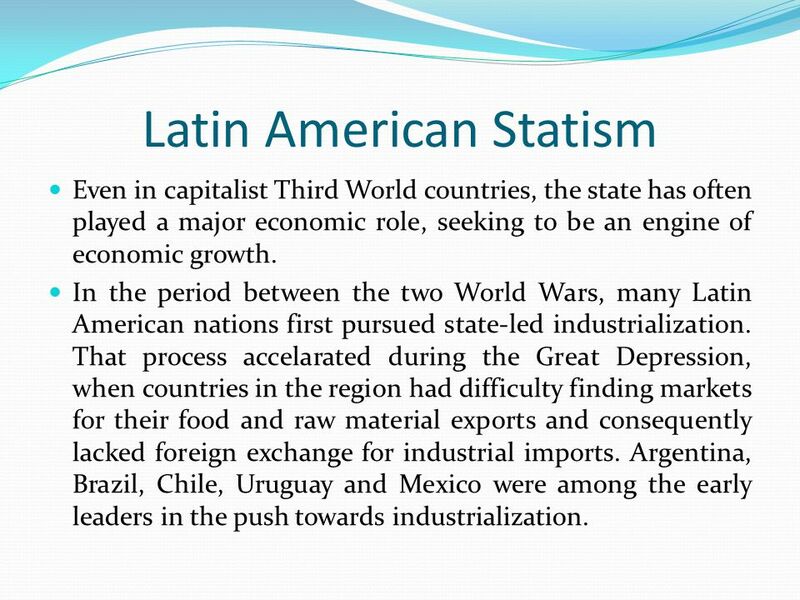 In the period between the two World Wars, many Latin American nations first pursued state-led industrialization. That process accelarated during the Great Depression, when countries in the region had difficulty finding markets for their food and raw material exports and consequently lacked foreign exchange for industrial imports. 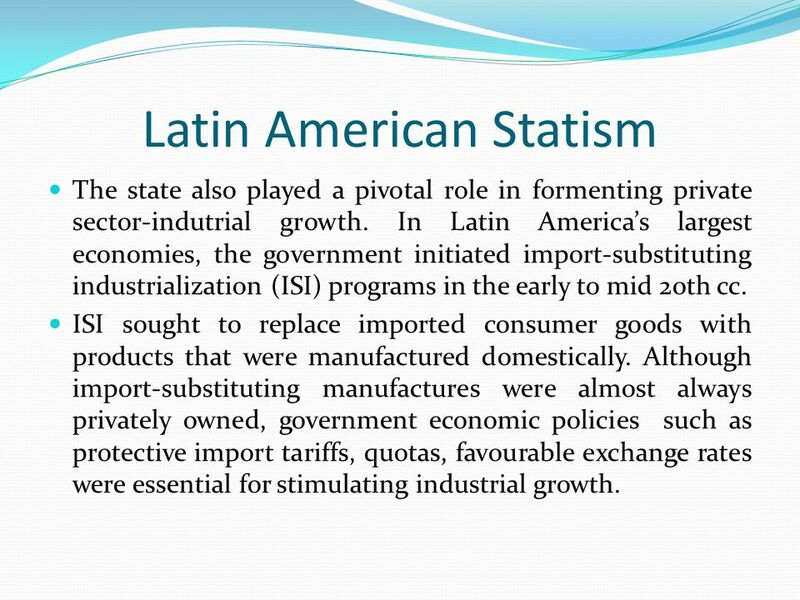 Argentina, Brazil, Chile, Uruguay and Mexico were among the early leaders in the push towards industrialization. 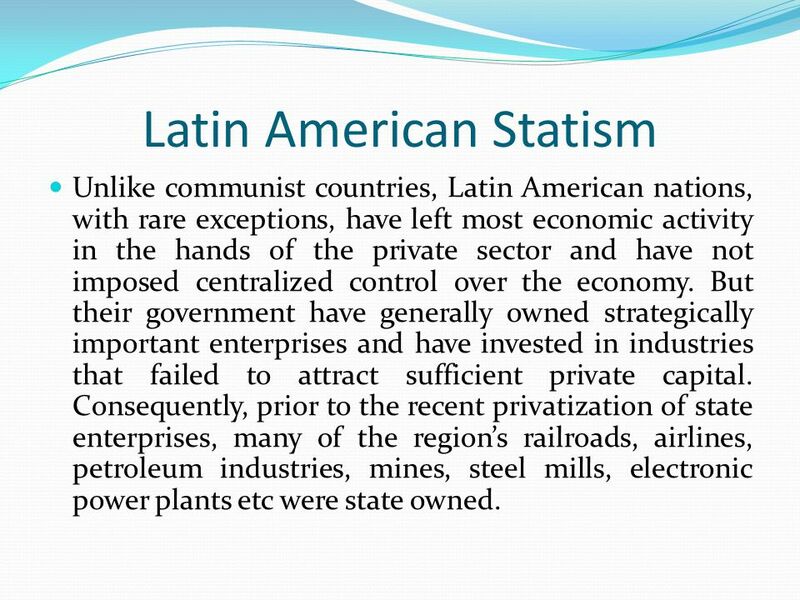 Unlike communist countries, Latin American nations, with rare exceptions, have left most economic activity in the hands of the private sector and have not imposed centralized control over the economy. But their government have generally owned strategically important enterprises and have invested in industries that failed to attract sufficient private capital. Consequently, prior to the recent privatization of state enterprises, many of the region’s railroads, airlines, petroleum industries, mines, steel mills, electronic power plants etc were state owned. Government takeovers frequently were not opposed by the domestic private sectors. 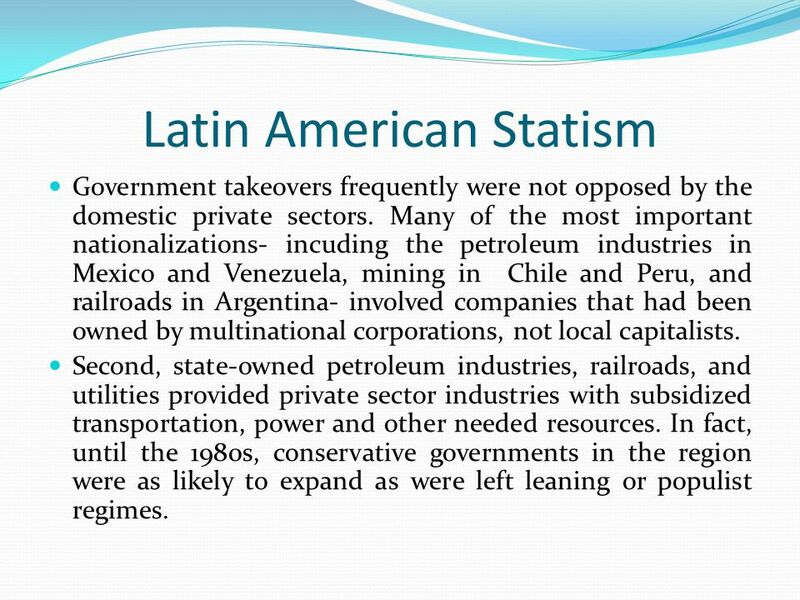 Many of the most important nationalizations- incuding the petroleum industries in Mexico and Venezuela, mining in Chile and Peru, and railroads in Argentina- involved companies that had been owned by multinational corporations, not local capitalists. Second, state-owned petroleum industries, railroads, and utilities provided private sector industries with subsidized transportation, power and other needed resources. In fact, until the 1980s, conservative governments in the region were as likely to expand as were left leaning or populist regimes. The state also played a pivotal role in formenting private sector-indutrial growth. In Latin America’s largest economies, the government initiated import-substituting industrialization (ISI) programs in the early to mid 20th cc. ISI sought to replace imported consumer goods with products that were manufactured domestically. Although import-substituting manufactures were almost always privately owned, government economic policies such as protective import tariffs, quotas, favourable exchange rates were essential for stimulating industrial growth. 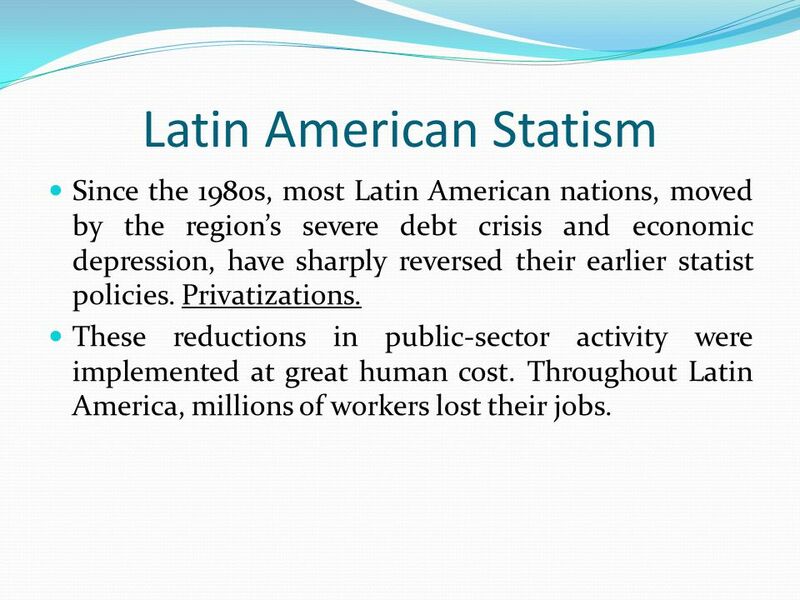 In Argentina, Brazil, Colombia, Mexico and elsewhere these state policies were quite succesful. 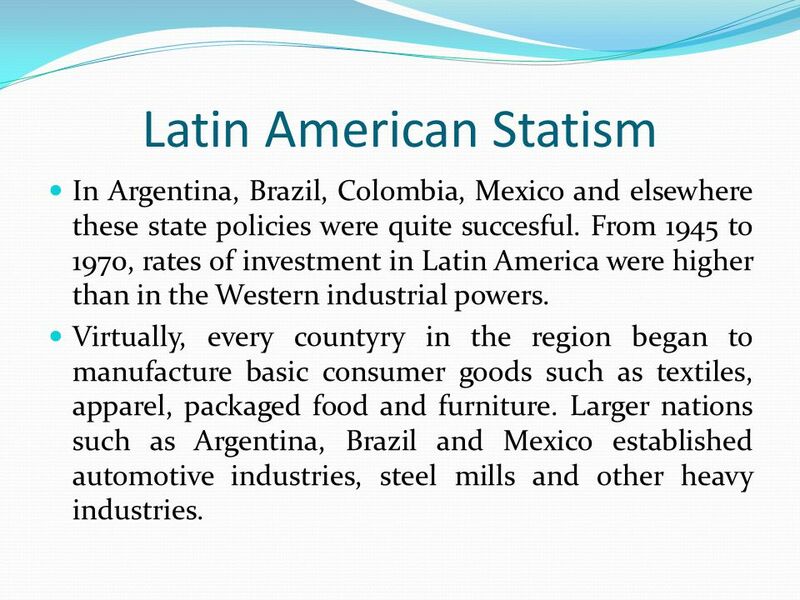 From 1945 to 1970, rates of investment in Latin America were higher than in the Western industrial powers. Virtually, every countyry in the region began to manufacture basic consumer goods such as textiles, apparel, packaged food and furniture. Larger nations such as Argentina, Brazil and Mexico established automotive industries, steel mills and other heavy industries. 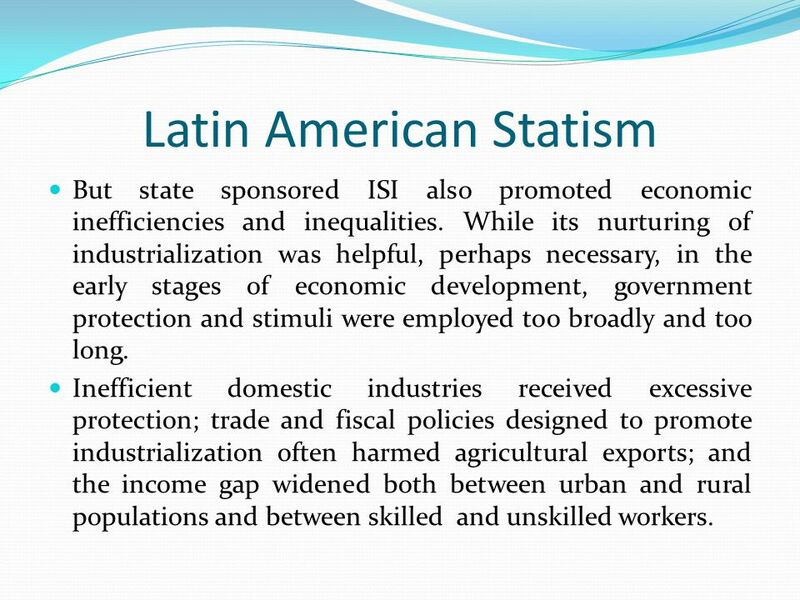 But state sponsored ISI also promoted economic inefficiencies and inequalities. While its nurturing of industrialization was helpful, perhaps necessary, in the early stages of economic development, government protection and stimuli were employed too broadly and too long. Inefficient domestic industries received excessive protection; trade and fiscal policies designed to promote industrialization often harmed agricultural exports; and the income gap widened both between urban and rural populations and between skilled and unskilled workers. 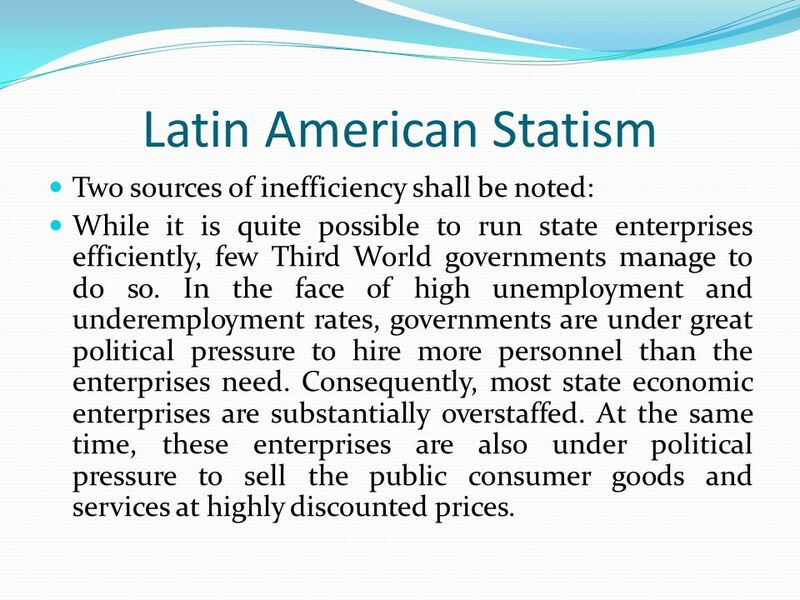 Two sources of inefficiency shall be noted: While it is quite possible to run state enterprises efficiently, few Third World governments manage to do so. In the face of high unemployment and underemployment rates, governments are under great political pressure to hire more personnel than the enterprises need. Consequently, most state economic enterprises are substantially overstaffed. At the same time, these enterprises are also under political pressure to sell the public consumer goods and services at highly discounted prices. 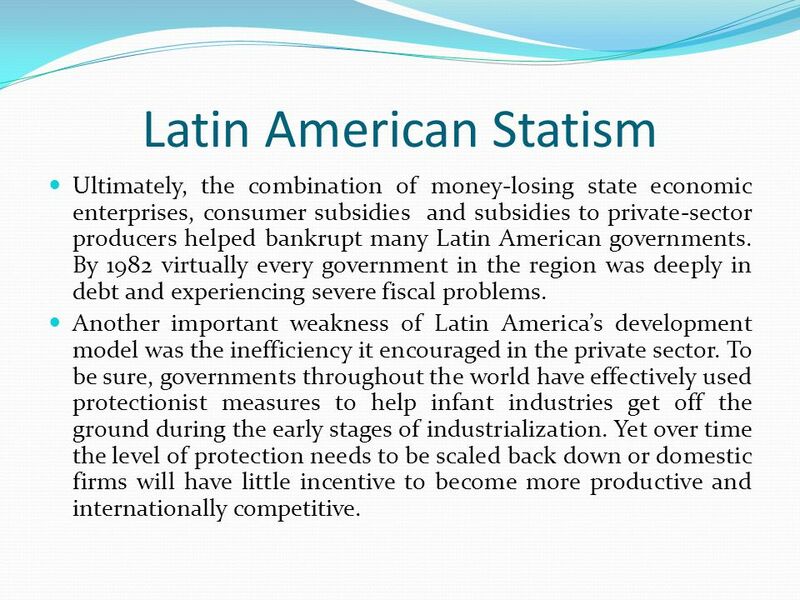 Ultimately, the combination of money-losing state economic enterprises, consumer subsidies and subsidies to private-sector producers helped bankrupt many Latin American governments. By 1982 virtually every government in the region was deeply in debt and experiencing severe fiscal problems. Another important weakness of Latin America’s development model was the inefficiency it encouraged in the private sector. To be sure, governments throughout the world have effectively used protectionist measures to help infant industries get off the ground during the early stages of industrialization. Yet over time the level of protection needs to be scaled back down or domestic firms will have little incentive to become more productive and internationally competitive. Since the 1980s, most Latin American nations, moved by the region’s severe debt crisis and economic depression, have sharply reversed their earlier statist policies. Privatizations. These reductions in public-sector activity were implemented at great human cost. Throughout Latin America, millions of workers lost their jobs. While Latin America have been struggling since the early 1980s, a number of East and Southeast Asian economies have grown at a phenomenal rate during most of that period. South Korea, Taiwan, Hong Kong and Singapore and China have received the most attention. Their impact on world trade has been enormous. China is now one of the US’s leading trading partners. 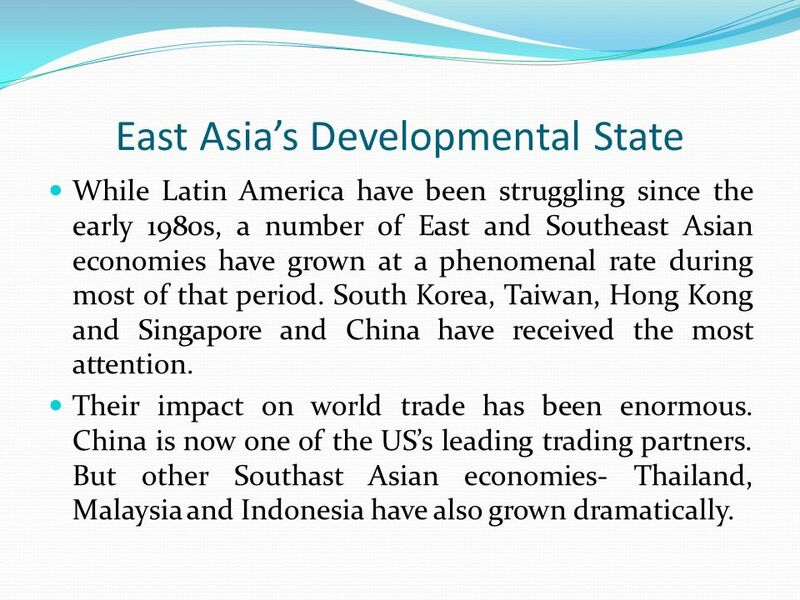 But other Southast Asian economies- Thailand, Malaysia and Indonesia have also grown dramatically. 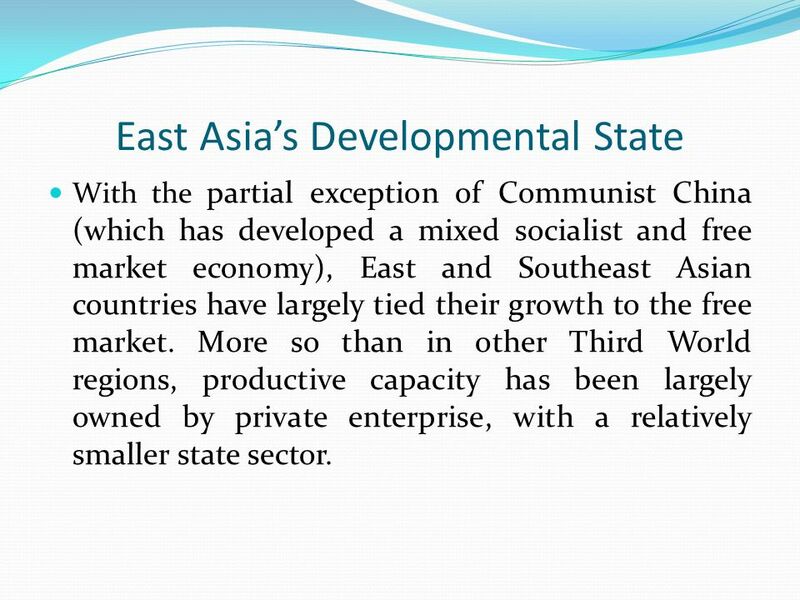 With the partial exception of Communist China (which has developed a mixed socialist and free market economy), East and Southeast Asian countries have largely tied their growth to the free market. More so than in other Third World regions, productive capacity has been largely owned by private enterprise, with a relatively smaller state sector. This has led conservative economists to hail East Asian economic miracle as a triumph of unfettered capitalism, a testimony to keeping government out of the economy. But many scholars specializing in East Asian economies argue that, to the contrary, governments in that region have been key players in stimulating economic growth. 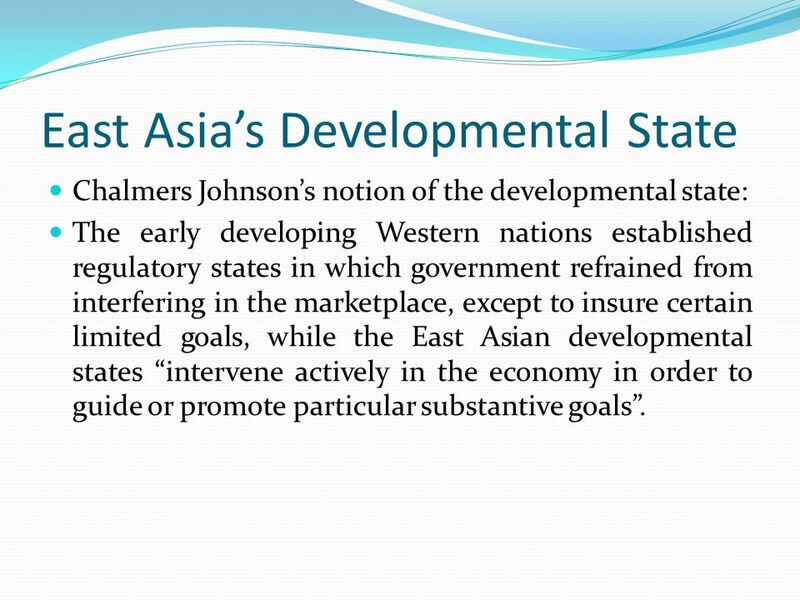 Chalmers Johnson’s notion of the developmental state: The early developing Western nations established regulatory states in which government refrained from interfering in the marketplace, except to insure certain limited goals, while the East Asian developmental states “intervene actively in the economy in order to guide or promote particular substantive goals”. Japan’s powerful Ministry of International Trade and Industry (MITI) directed that country’s postwar industrial resurgence. 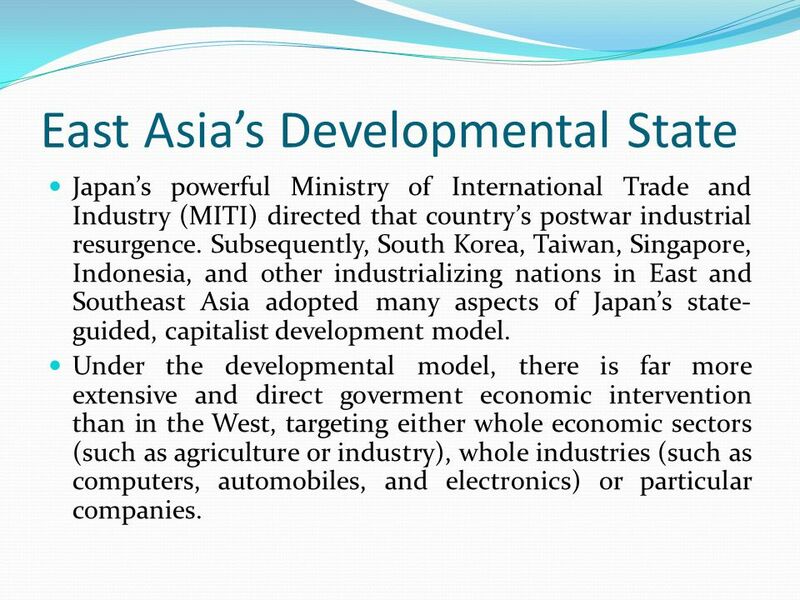 Subsequently, South Korea, Taiwan, Singapore, Indonesia, and other industrializing nations in East and Southeast Asia adopted many aspects of Japan’s state-guided, capitalist development model. Under the developmental model, there is far more extensive and direct goverment economic intervention than in the West, targeting either whole economic sectors (such as agriculture or industry), whole industries (such as computers, automobiles, and electronics) or particular companies. But can this model be applicable elsewhere? 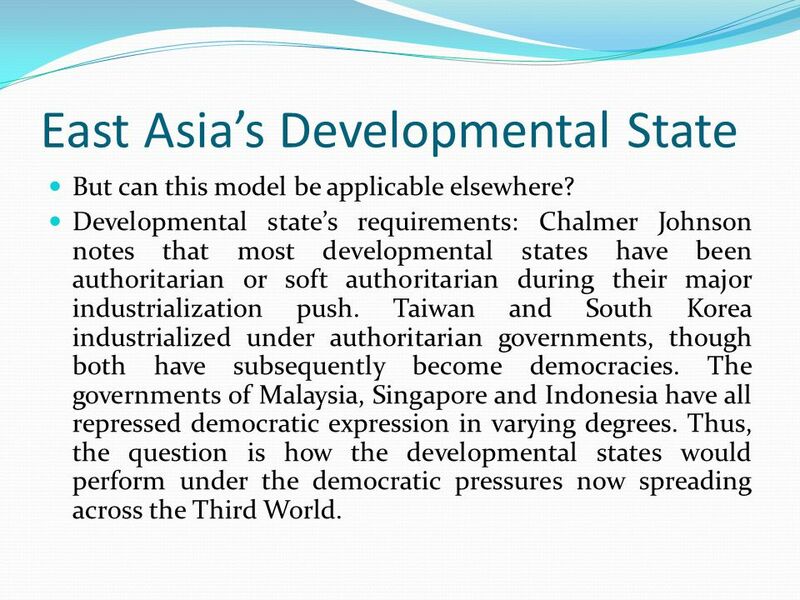 Developmental state’s requirements: Chalmer Johnson notes that most developmental states have been authoritarian or soft authoritarian during their major industrialization push. Taiwan and South Korea industrialized under authoritarian governments, though both have subsequently become democracies. The governments of Malaysia, Singapore and Indonesia have all repressed democratic expression in varying degrees. Thus, the question is how the developmental states would perform under the democratic pressures now spreading across the Third World. Another important question is the transferability of East Asian political and economic practices to other parts of the Third World. 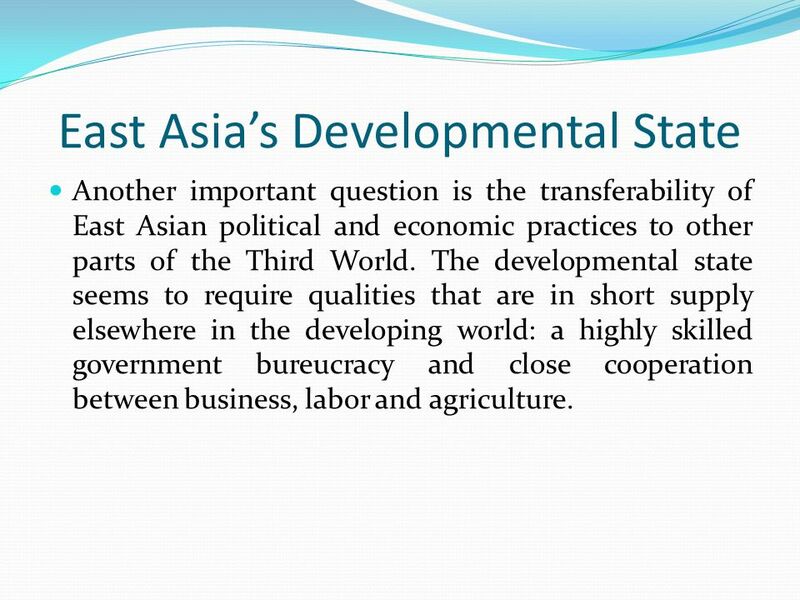 The developmental state seems to require qualities that are in short supply elsewhere in the developing world: a highly skilled government bureucracy and close cooperation between business, labor and agriculture. 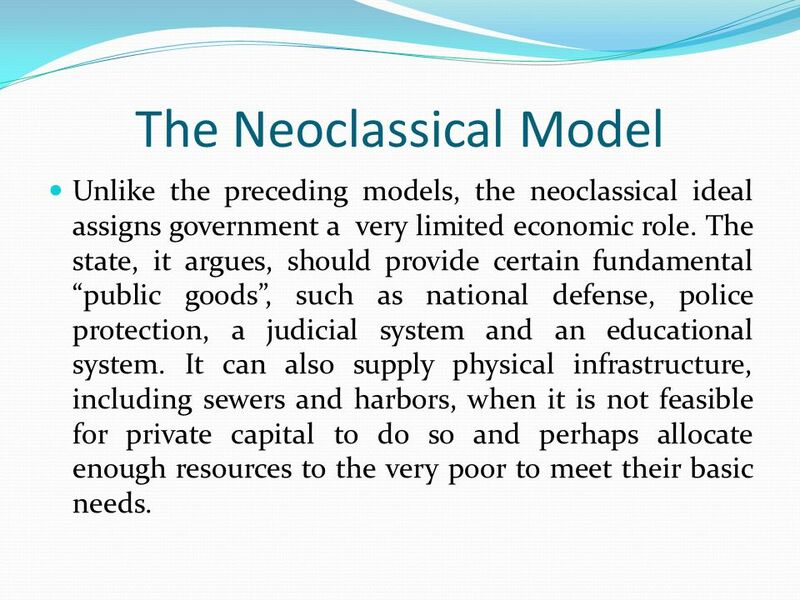 Unlike the preceding models, the neoclassical ideal assigns government a very limited economic role. The state, it argues, should provide certain fundamental “public goods”, such as national defense, police protection, a judicial system and an educational system. It can also supply physical infrastructure, including sewers and harbors, when it is not feasible for private capital to do so and perhaps allocate enough resources to the very poor to meet their basic needs. 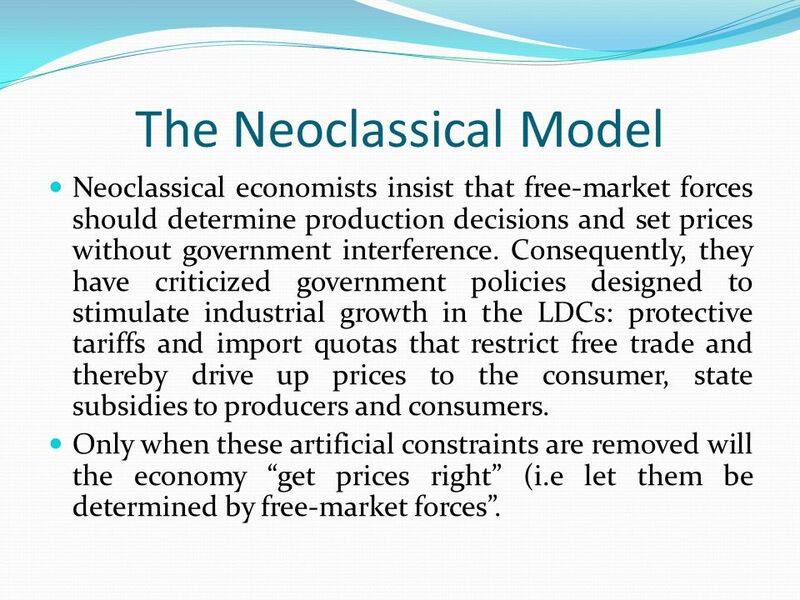 Neoclassical economists insist that free-market forces should determine production decisions and set prices without government interference. Consequently, they have criticized government policies designed to stimulate industrial growth in the LDCs: protective tariffs and import quotas that restrict free trade and thereby drive up prices to the consumer, state subsidies to producers and consumers. Only when these artificial constraints are removed will the economy “get prices right” (i.e let them be determined by free-market forces”. 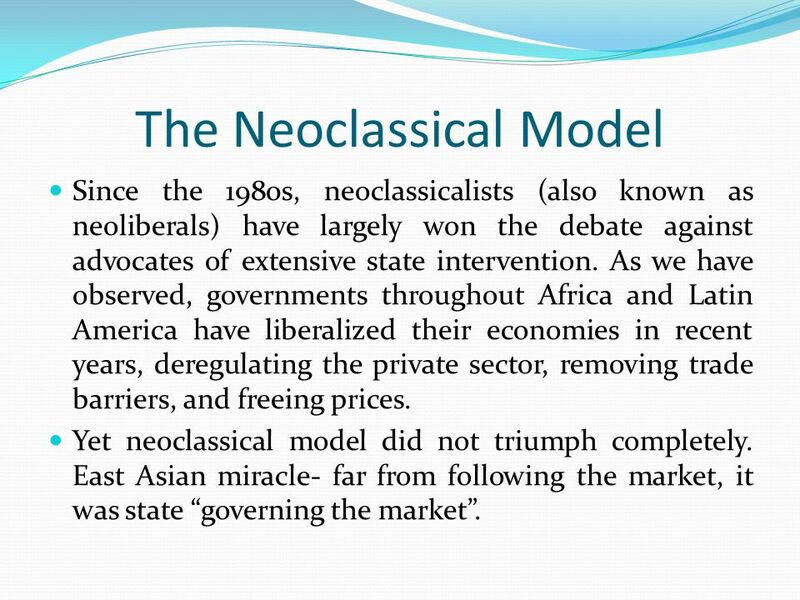 Since the 1980s, neoclassicalists (also known as neoliberals) have largely won the debate against advocates of extensive state intervention. As we have observed, governments throughout Africa and Latin America have liberalized their economies in recent years, deregulating the private sector, removing trade barriers, and freeing prices. Yet neoclassical model did not triumph completely. 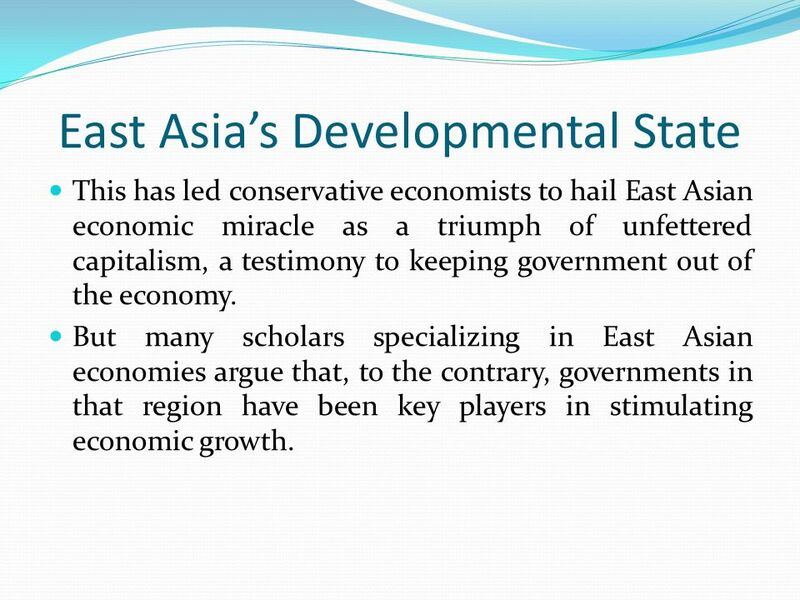 East Asian miracle- far from following the market, it was state “governing the market”. 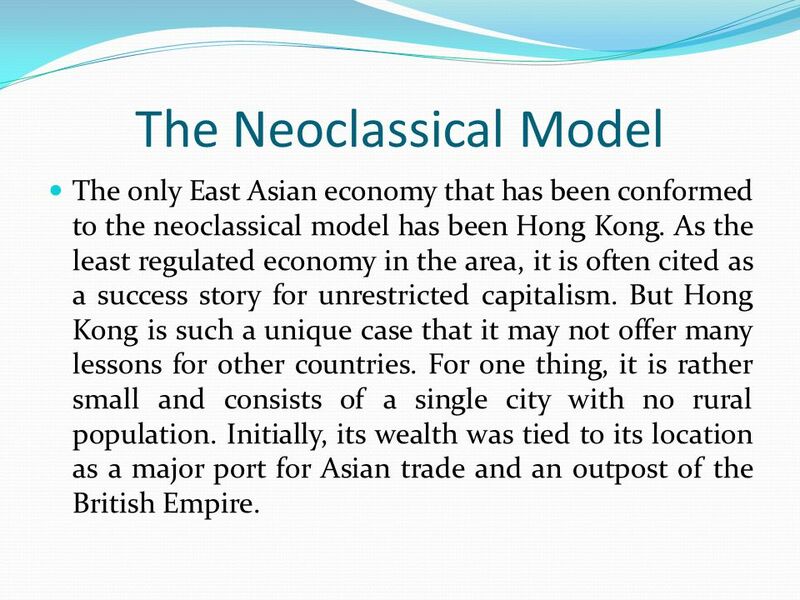 The only East Asian economy that has been conformed to the neoclassical model has been Hong Kong. As the least regulated economy in the area, it is often cited as a success story for unrestricted capitalism. But Hong Kong is such a unique case that it may not offer many lessons for other countries. For one thing, it is rather small and consists of a single city with no rural population. Initially, its wealth was tied to its location as a major port for Asian trade and an outpost of the British Empire. Since the time of Britain’s industrial revolution, governments have equated industrialization with economic development, economic sovereignity and military strength. 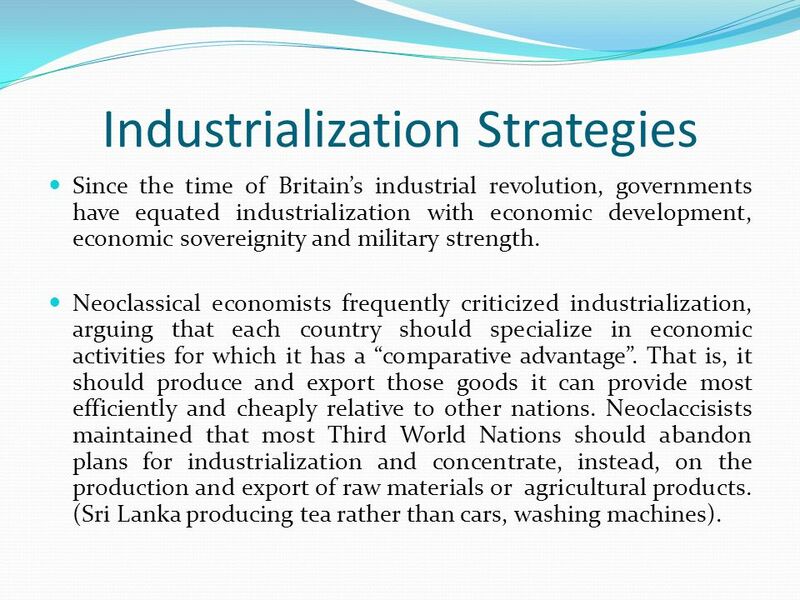 Neoclassical economists frequently criticized industrialization, arguing that each country should specialize in economic activities for which it has a “comparative advantage”. That is, it should produce and export those goods it can provide most efficiently and cheaply relative to other nations. Neoclaccisists maintained that most Third World Nations should abandon plans for industrialization and concentrate, instead, on the production and export of raw materials or agricultural products. (Sri Lanka producing tea rather than cars, washing machines). 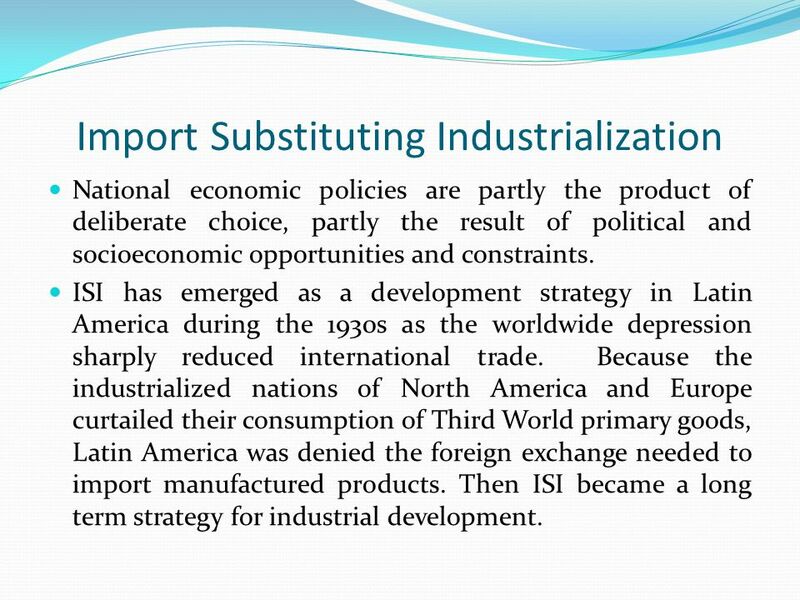 Industrializing nations have generally pursued two alternative strategies: import-substituting industrialization (ISI) and export-oriented industrialization (EOI). In the first case, LDCs reduce their dependency on manufactured imports by producing more of them at home. While ISI has been most closely identified with Latin America, it is a strategy that has been used, at least initially, in most of the developing world. While ISI focuses on producing consumer goods for the home market, EOI stresses industrial development with East and Southeast Asia, it is a strategy now widely embraced in Latin America and other parts of the Third World. National economic policies are partly the product of deliberate choice, partly the result of political and socioeconomic opportunities and constraints. ISI has emerged as a development strategy in Latin America during the 1930s as the worldwide depression sharply reduced international trade. Because the industrialized nations of North America and Europe curtailed their consumption of Third World primary goods, Latin America was denied the foreign exchange needed to import manufactured products. 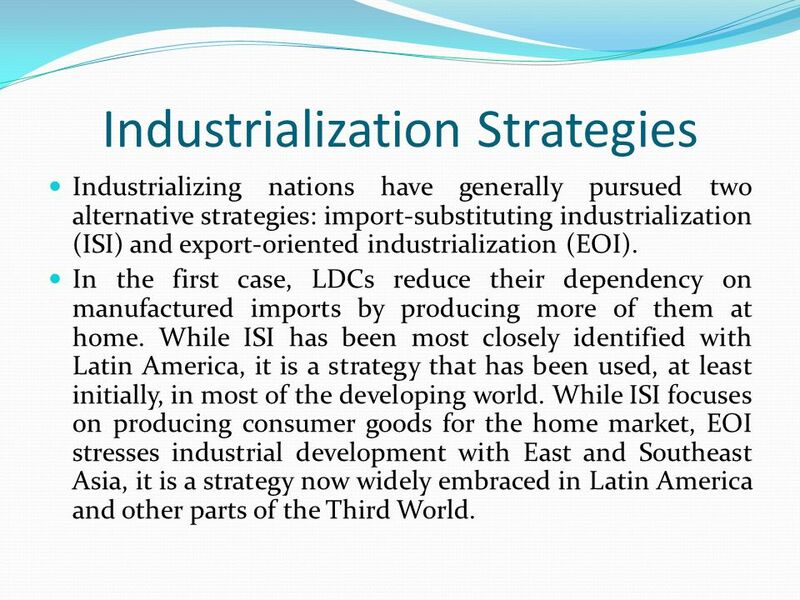 Then ISI became a long term strategy for industrial development. 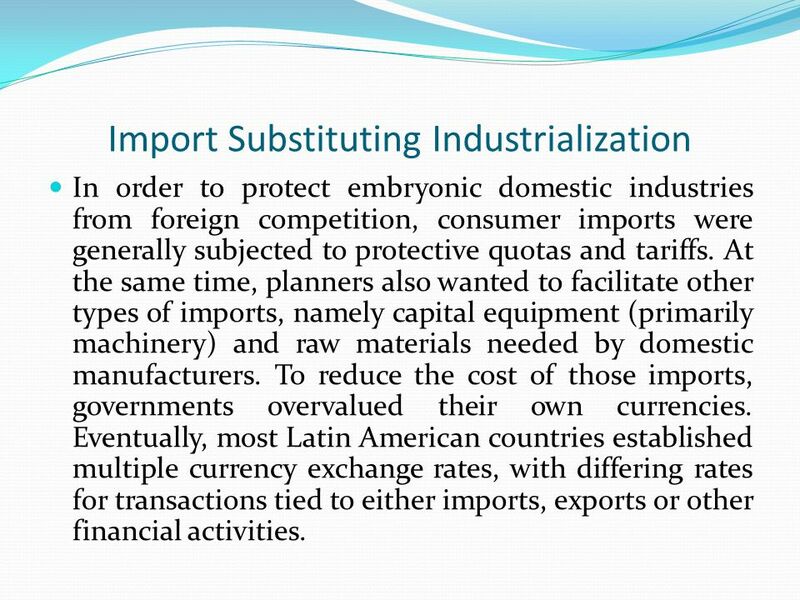 In order to protect embryonic domestic industries from foreign competition, consumer imports were generally subjected to protective quotas and tariffs. At the same time, planners also wanted to facilitate other types of imports, namely capital equipment (primarily machinery) and raw materials needed by domestic manufacturers. To reduce the cost of those imports, governments overvalued their own currencies. Eventually, most Latin American countries established multiple currency exchange rates, with differing rates for transactions tied to either imports, exports or other financial activities. Overvalued currencies and export taxes put traditional primary goods exporters at a competitive disadvantage, thereby depriving the country of needed foreign exchange revenues. Because local consumer goods manufacturers were allowed to import capital goods cheaply, the region never developed its own capital-goods industry and instead, imported manufacturing technologies that were inappropriate to local needs. 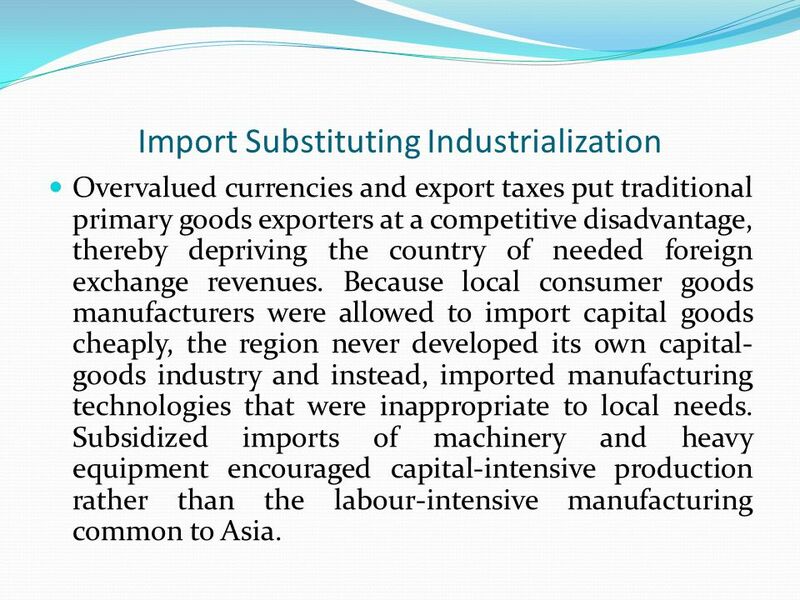 Subsidized imports of machinery and heavy equipment encouraged capital-intensive production rather than the labour-intensive manufacturing common to Asia. The ISI model of industrialization benefited a small, relatively well-paid “labor elite”. But it failed to provide enough jobs for the region’s unemployed and underemployed. 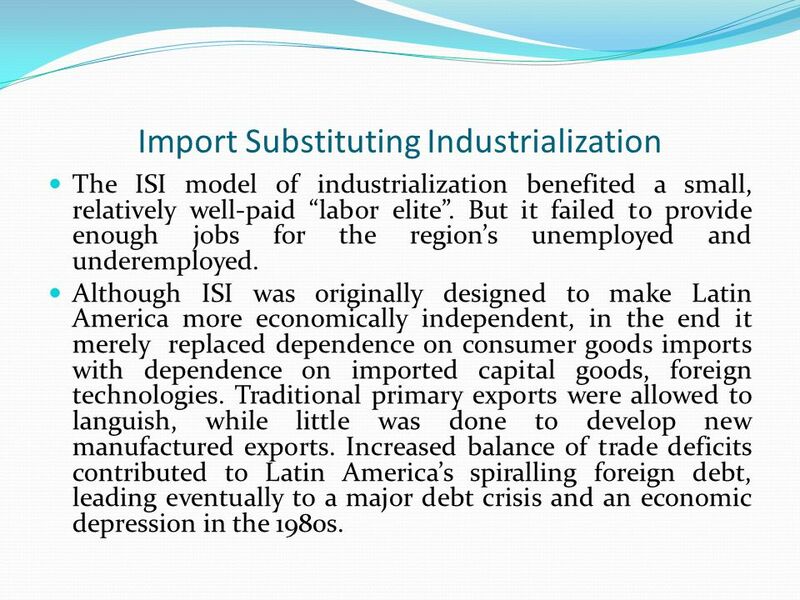 Although ISI was originally designed to make Latin America more economically independent, in the end it merely replaced dependence on consumer goods imports with dependence on imported capital goods, foreign technologies. Traditional primary exports were allowed to languish, while little was done to develop new manufactured exports. Increased balance of trade deficits contributed to Latin America’s spiralling foreign debt, leading eventually to a major debt crisis and an economic depression in the 1980s. East Asia’s Newly Industrialized Countries initiated their industrialization drive through import substitution, just as their Latin American counterparts had done earlier. Soon, they diversified into manufacturing for export. By 1980, manufactured products constituted more than 90 percent of all South Korean and Taiwanese exports but represented only 15 percent in Mexico and 39 percent in Brazil. 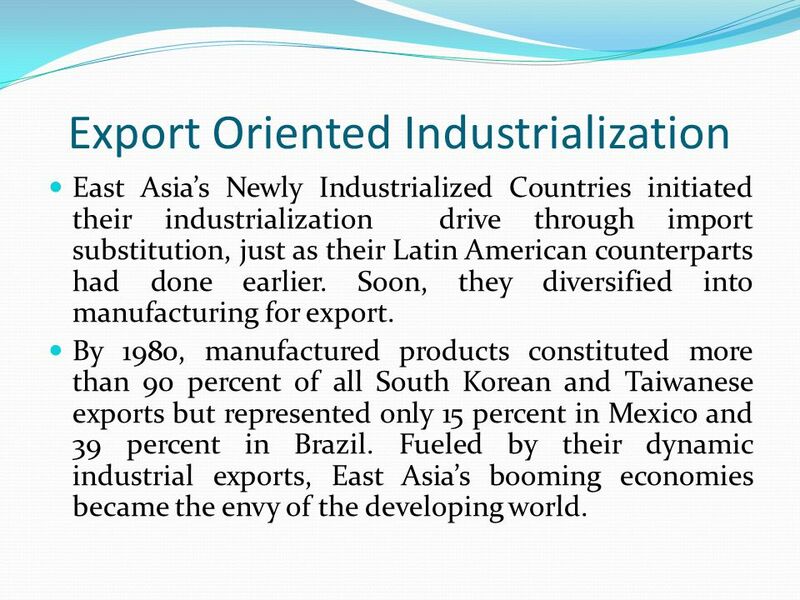 Fueled by their dynamic industrial exports, East Asia’s booming economies became the envy of the developing world. 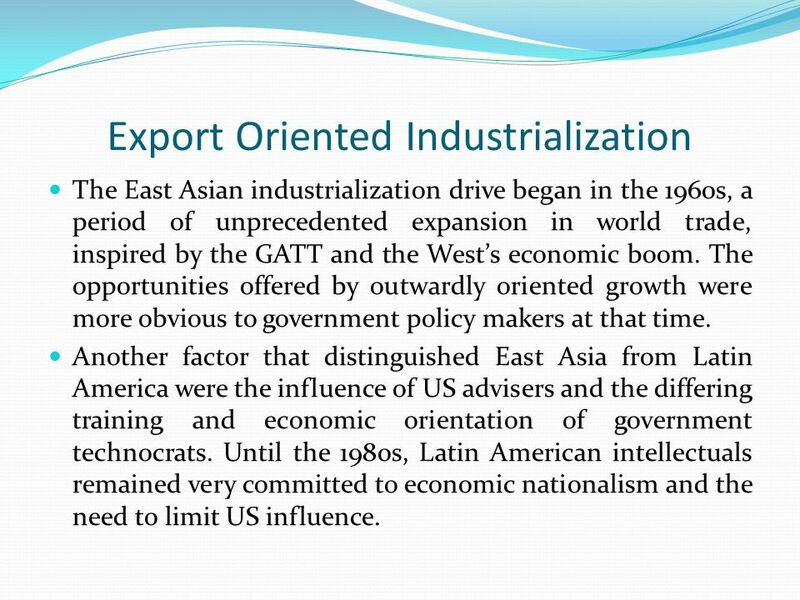 The East Asian industrialization drive began in the 1960s, a period of unprecedented expansion in world trade, inspired by the GATT and the West’s economic boom. The opportunities offered by outwardly oriented growth were more obvious to government policy makers at that time. Another factor that distinguished East Asia from Latin America were the influence of US advisers and the differing training and economic orientation of government technocrats. Until the 1980s, Latin American intellectuals remained very committed to economic nationalism and the need to limit US influence. 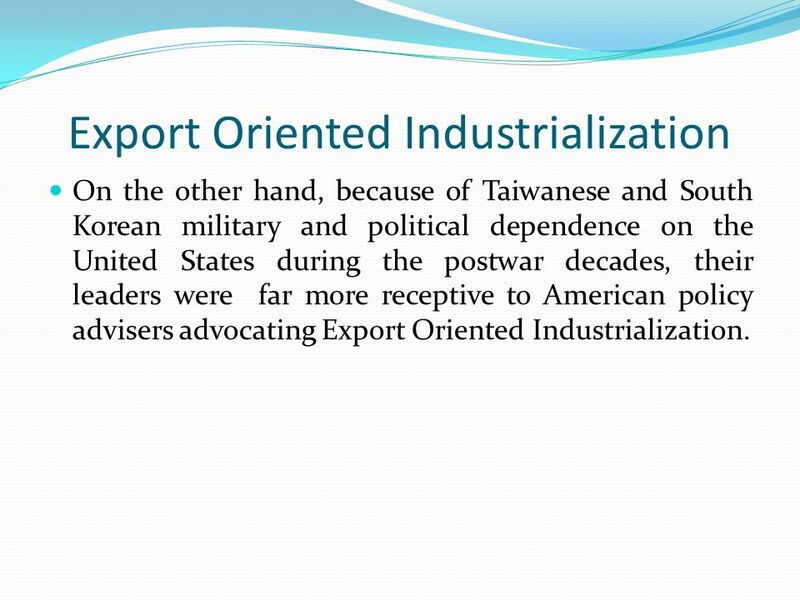 On the other hand, because of Taiwanese and South Korean military and political dependence on the United States during the postwar decades, their leaders were far more receptive to American policy advisers advocating Export Oriented Industrialization. 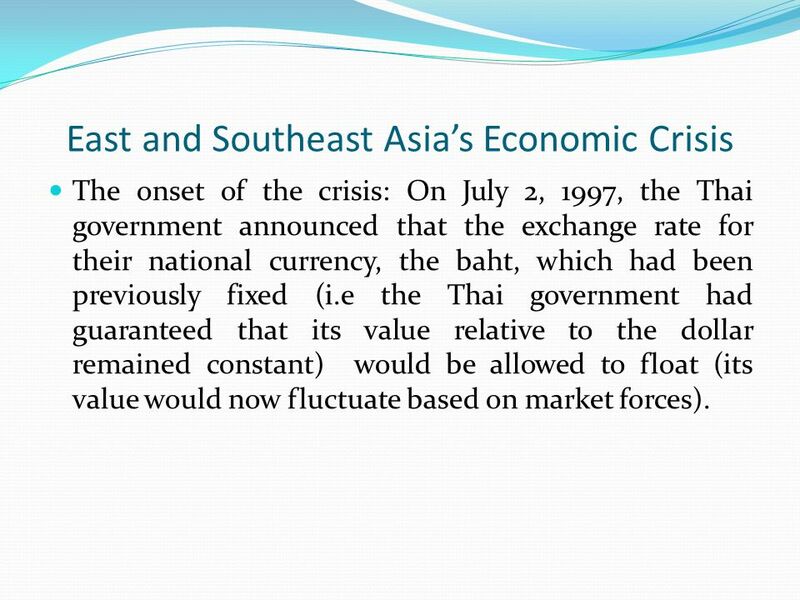 The onset of the crisis: On July 2, 1997, the Thai government announced that the exchange rate for their national currency, the baht, which had been previously fixed (i.e the Thai government had guaranteed that its value relative to the dollar remained constant) would be allowed to float (its value would now fluctuate based on market forces). As the value of the baht fell, investments in the Thai stock exchange and bank accounst held in bahts also lost value. 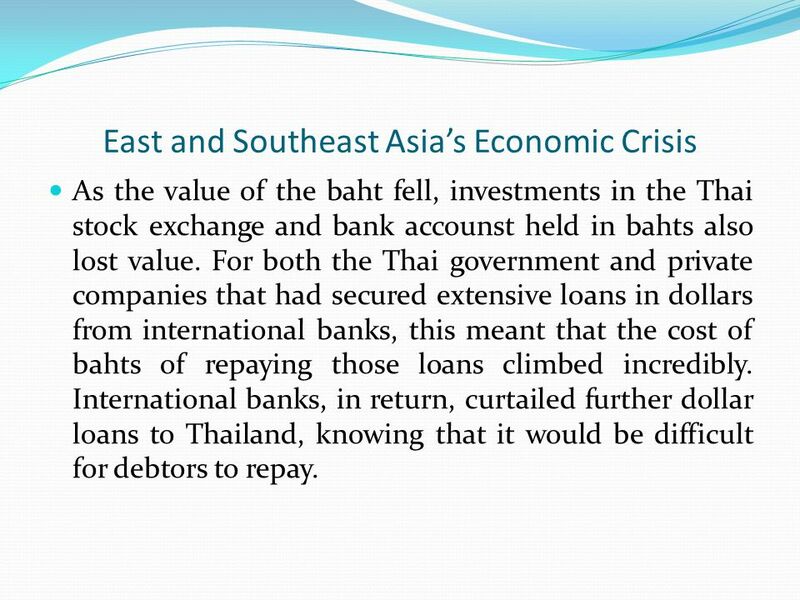 For both the Thai government and private companies that had secured extensive loans in dollars from international banks, this meant that the cost of bahts of repaying those loans climbed incredibly. International banks, in return, curtailed further dollar loans to Thailand, knowing that it would be difficult for debtors to repay. Companies that imported consumer goods or manufacturing inputs (machinery, raw materials, technology) found the price of doing business sharply increasing as the value of the baht declined. 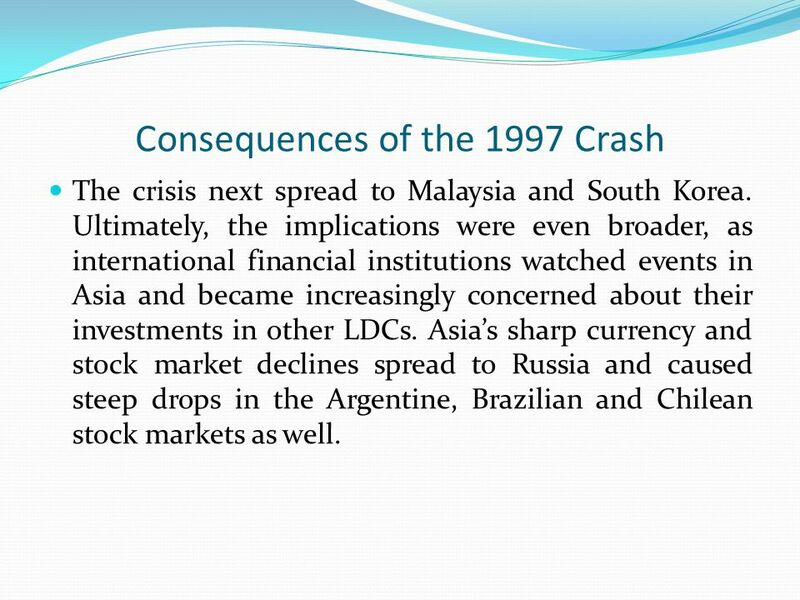 1997 crisis was not limited to Thailand. 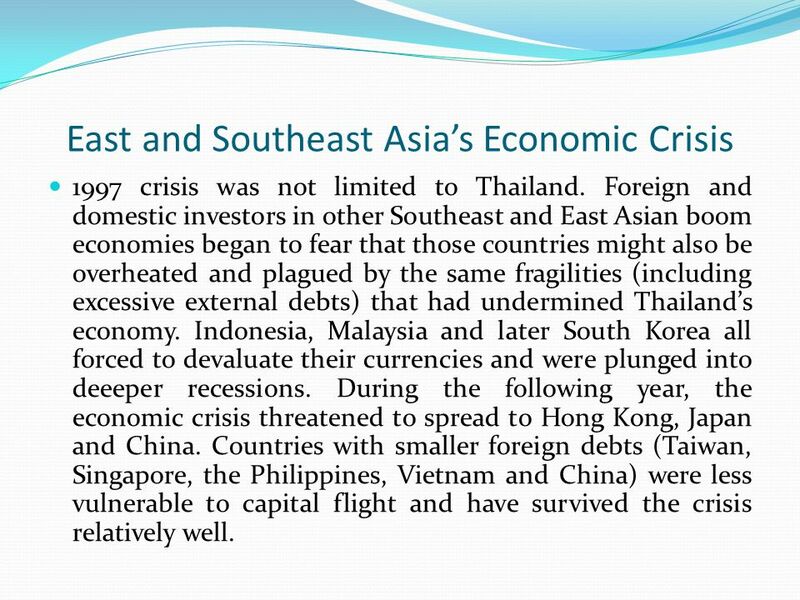 Foreign and domestic investors in other Southeast and East Asian boom economies began to fear that those countries might also be overheated and plagued by the same fragilities (including excessive external debts) that had undermined Thailand’s economy. Indonesia, Malaysia and later South Korea all forced to devaluate their currencies and were plunged into deeeper recessions. During the following year, the economic crisis threatened to spread to Hong Kong, Japan and China. Countries with smaller foreign debts (Taiwan, Singapore, the Philippines, Vietnam and China) were less vulnerable to capital flight and have survived the crisis relatively well. 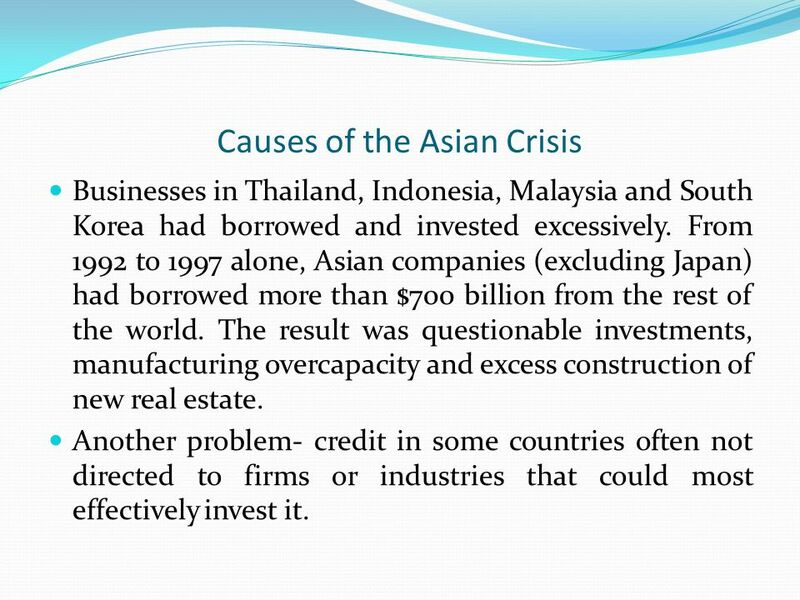 Businesses in Thailand, Indonesia, Malaysia and South Korea had borrowed and invested excessively. From 1992 to 1997 alone, Asian companies (excluding Japan) had borrowed more than $700 billion from the rest of the world. The result was questionable investments, manufacturing overcapacity and excess construction of new real estate. Another problem- credit in some countries often not directed to firms or industries that could most effectively invest it. These underlying long-term weaknesses were then aggravated by additional short-term problems. 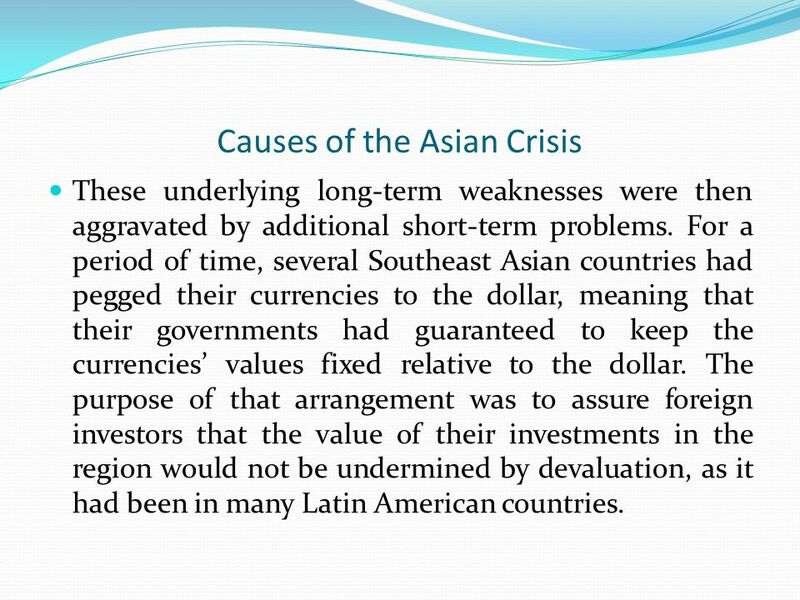 For a period of time, several Southeast Asian countries had pegged their currencies to the dollar, meaning that their governments had guaranteed to keep the currencies’ values fixed relative to the dollar. The purpose of that arrangement was to assure foreign investors that the value of their investments in the region would not be undermined by devaluation, as it had been in many Latin American countries. 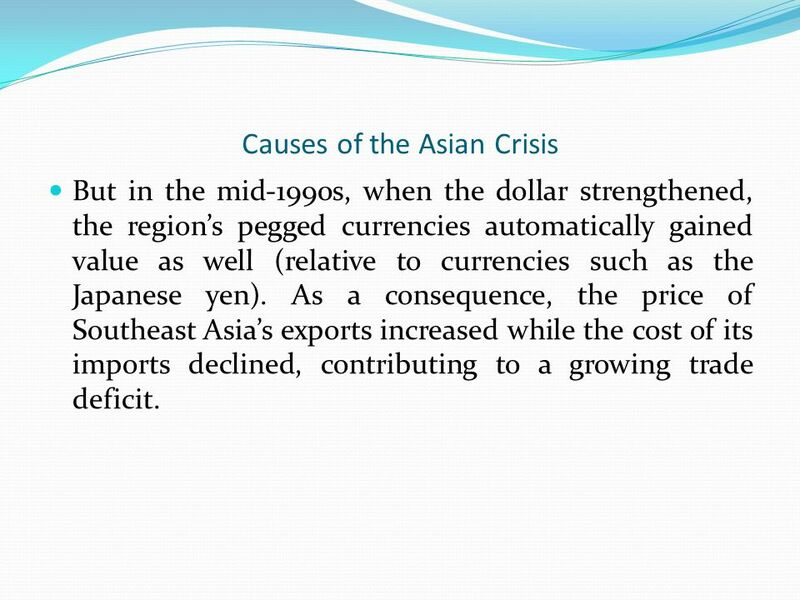 But in the mid-1990s, when the dollar strengthened, the region’s pegged currencies automatically gained value as well (relative to currencies such as the Japanese yen). As a consequence, the price of Southeast Asia’s exports increased while the cost of its imports declined, contributing to a growing trade deficit. The crisis next spread to Malaysia and South Korea. Ultimately, the implications were even broader, as international financial institutions watched events in Asia and became increasingly concerned about their investments in other LDCs. Asia’s sharp currency and stock market declines spread to Russia and caused steep drops in the Argentine, Brazilian and Chilean stock markets as well. As Asia’s financial crisis intensified, the region sank into a deep economic recession, inflicting enormous pain on the population. Unable to pay their debts, many companies were forced into bankruptcy, throwing their employees out of work. It shall be underlined that the key causal factor behind the crisis have been external indebtedness. Countries such as Thailand, Indonesia and South Korea which had borrowed excessively, got into trouble. Those that had either exercised restraint (Taiwan and China) or had been unable to secure extensive foreign credit (the Philipines and Vietnam) were not badly hurt. 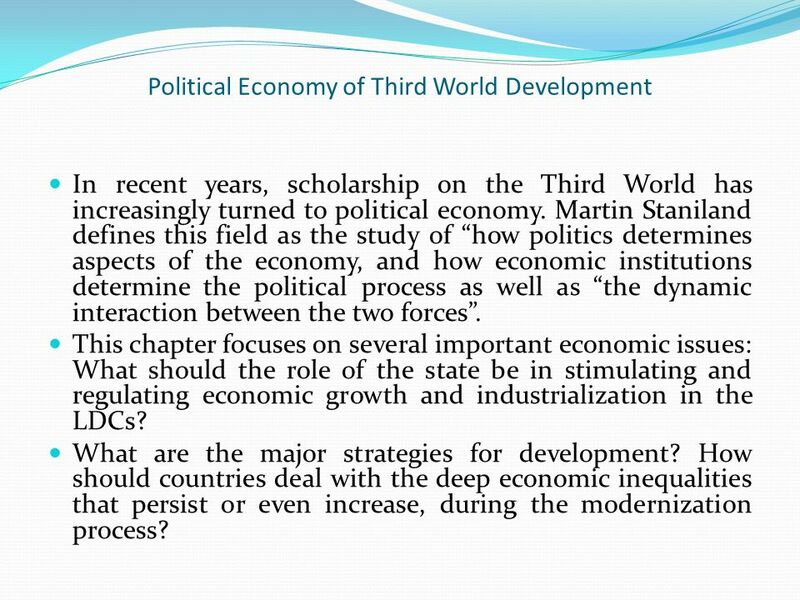 Download ppt "Political Economy of Third World Development"
Trade in Developing Countries 2/27/2012 Unit 2: Trade Policy. Lecture: trade in developing countries. 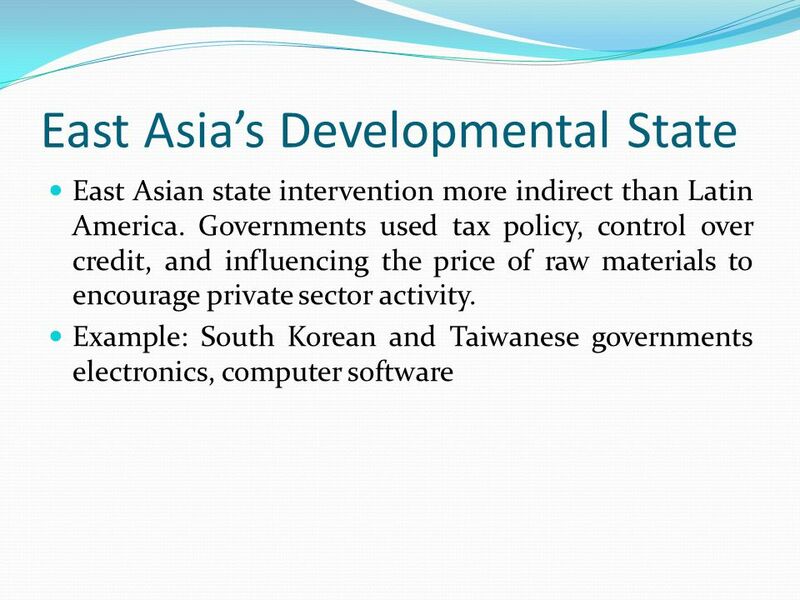 Trade in developing countries Infant industry argument (already introduced in previous lectures, here I will develop. ©2009 The McGraw-Hill Companies, All Rights Reserved ©2009 The McGraw-Hill Companies, All Rights Reserved Chapter 6 International Business McGraw-Hill/Irwin. Copyright © 2012 Pearson Addison-Wesley. All rights reserved. Chapter 11 Trade Policy in Developing Countries. Diffusion of Development: The Late- Industrializing Model and Greater East Asia Alice Amsden Amsden, Alice H. (1991), “Diffusion of Development: The Late-Industrializing. Kimberly Husa ; Miri Nam. The Asia’s Experiences  East Asian countries were remarkable in developing world until 1997  Rapid growth rate brought them. 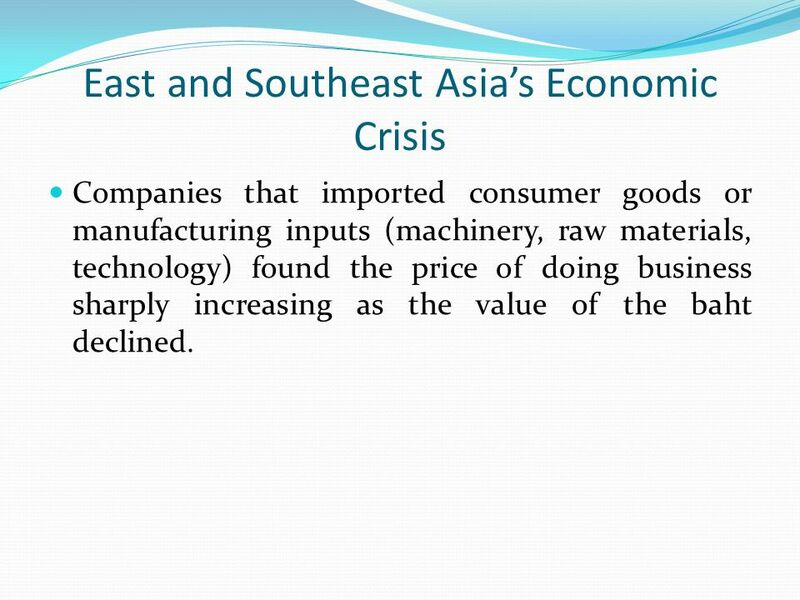 Slides prepared by Thomas Bishop Chapter 10 Trade Policy in Developing Countries. Towards Inward Looking Development Lecture # 8 Week 4. Mexico, Iran & Nigeria. Mexico & Iran Both countries have experienced rapid economic and political change that has transformed each country into a stable. 3.1 What Is an Economy? MARKETING MR. PAVONE. Economic Systems.